In 2018, after months of frustration trying to use Pinterest to grow From Pennies to Plenty, I decided to learn how to use it strategically. I’m happy to say that my Pinterest numbers and blog traffic have been going up. There are several reasons for this. Besides being more strategic with my pinning, I’ve been making pins that appeal to viewers. 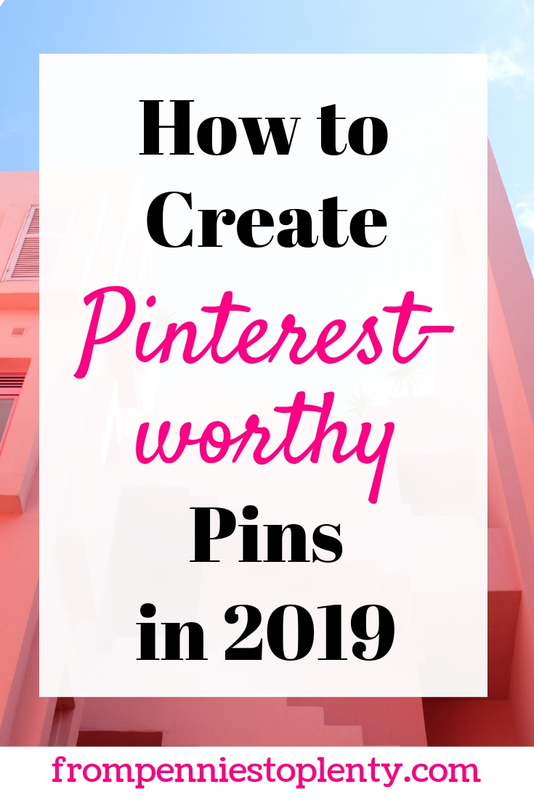 As I researched more and more about how to make visually appealing pins, I put the information in a document that turned into this article on the keys to making a great Pinterest-worthy pin. Why do you want a great pin? 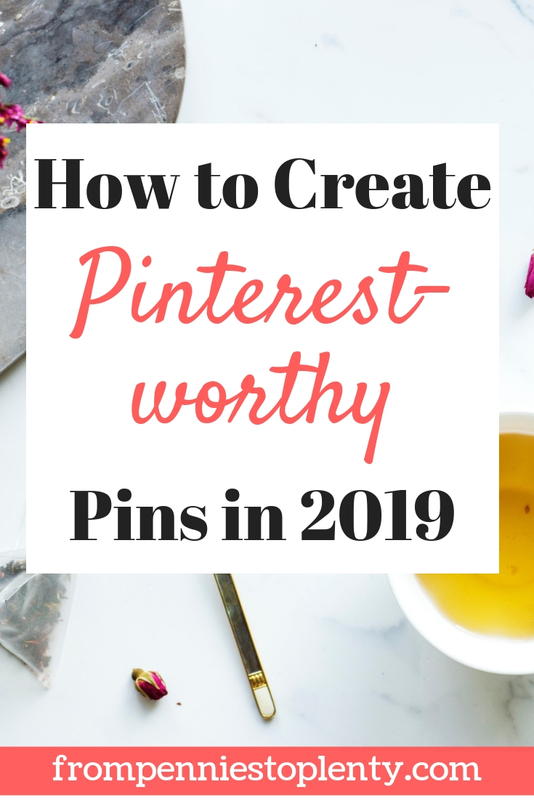 If you’re new to Pinterest, you might be asking what the point is of having a great pin. A great pin does more than look pretty. The most important thing a great pin can do for you is drive traffic to your site. It appeals to the viewer so that he or she clicks on the pin and goes to your website to read your article. In order to do that, a great pin creates curiosity, answers a viewer’s question or need, and/or solves a problem. It’s also easy to read. I wasn’t sure how to make a good pin when I started blogging. I’ve practiced a lot and received feedback on my pins. I’ve also spent a lot of time on Pinterest viewing both popular and unpopular pins. Here’s what I’ve learned on how to make a great pin. The best pins are oriented vertically. They’re not square or horizontal. Pinterest says you can use square pins, but they’re not as popular. You’ll find that a lot of group boards request that you only pin vertical pins as well. Most pins are a 2:3 ratio. The most common sizes you’ll hear about are 600:900 px and 735:1102 pix. I make my pins on Canva, where the pin template is 735:1102 px. You may see longer pins while browsing on Pinterest. This is common for people showcasing recipes and multi-step DIY projects. I make longer pins myself sometimes, but they’re not ridiculously long. If you make them too long, there’s the risk that the full image will get cut off or won’t be shown as often. Most of these pins are made at a 2:3 ratio. One is a little longer but still shown in full. You want to use images that fit with your post. If your blog post is about Greece, then your pin will ideally show pictures of Greece, something Greek, or something else related to your post like beaches and food. This is especially important if your picture features prominently on the pin. There are other times when your picture may be barely seen. You might have a large text overlay or a design that covers most of the picture. In those cases, your picture doesn’t have to be as closely related. You may pick the picture for its bright colors or patterns. For example, you could be writing about tips for a trip to Greece. Your background photo could be blue and white (Greek national colors) or it could be bright blue and pink because you’re talking about vacation fun. Below are two pins that have performed well. The first has a delicious taco pictured, which relates to the post topic of meals. The second is not a specific pictured item but shadowy hearts work for Valentine’s Day. Stock photos vs. your own photos. Most new bloggers use stock photos because they don’t have time to learn or stage their own photos. I’ve heard some people frown upon using stock photos. Everyone else uses them so you may see your photo used with another pin. There’s also talk that Pinterest favors unique photos. I still think it’s reasonable to use stock photos. Why? You can crop the photos and design your pins to look different than everyone else’s. You might see the same photo floating around a few times on Pinterest, but if you’ve made yours look unique, people aren’t going to confuse you with another blogger and their content. You can still achieve popular and even viral pins while using stock photos. You can get lots of stock photos for free!!! Haute Stock – You can receive a few monthly freebies for being on their mailing list. Paid membership is $99 per quarter or $299 per year. DepositPhotos – This has various pricing plans based on your needs. You can save by waiting for sales to buy the photos. Adobe Stock – You can receive 10 photos with a free 30-day trial. Then it’s about $30 for 10 photos per month. Pinterest is a visual platform and readers scroll quickly through their feeds of hundreds or thousands of pins. You need to catch a viewer’s eyes. Brighter colors stand out, so it’s not surprising they do well. More neutral colors, white, and dark colors aren’t completely off limits. You’ll regularly see pins with these colors, but they often have an accent color that makes them pop out to the reader. If you have brand colors, you may want to use them so that people recognize your pins by them. I prefer to try out new colors and color combinations as well as pin designs to see what gains traction. Use fonts that are easy to read at a quick glance. Your pins need to be legible on a cell phone, tablet, laptop, and desktop. Do you scroll quickly through your Pinterest feed? Take a look at what stands out to you from other people’s pins. They probably use mostly large print font. Some script font is okay as long as it’s also easy to read. Script fonts can be a nice touch to emphasize special words in your title. I like to use 2-3 fonts per pin. Both of the below pins are easy to read even when scrolling on a phone or tablet. Even script font can be easy to read if you’re careful about which ones you use. When I first started making pins, I thought that the titles had to be exactly the same as my blog post title. How silly I was! While it’s nice to have your pin reflect your post, it doesn’t need to have the exact same wording. In fact, if you’re making several pins for your post, it’s a good idea to vary the wording a bit to see which one catches the most attention. You might also add a call to action and a picture of your freebie or opt-in if you have one. Don’t forget to add your brand name and/or logo too. The two pins below were made for the same post but highlight different things. You might find that one attracts more clicks than the other. Another best practice is to make more than one pin for each of your posts. I like to make 2-5 different pins per post. I don’t make them all at once due to limited time. I make additional pins and launch them over time, especially if I know the first ones have done well. Some people do what they call A/B testing. They launch two nearly identical pins to Pinterest. The pins only have one difference between them. It usually using two different pictures. It may be a change in the description or the hashtags used. The idea is to compare the two pins over time to see which is better performing and then keep promoting that pin. Pin descriptions should be as well thought out as your pin image. Write a short description using keywords that relate to your topic. Write sentences to make the description sound normal while inserting the keywords in there. I like to ask a question, then provide my post as a solution. I’ll put a call to action (e.g., take a look…, check out this…, find the answers…) in the description as well. Example: Is your New Year’s resolution to create a budget that works? If your goals are to pay off debt and save money, take a look at these 10 tips that helped me manage money better. One additional point I want to make about the description is to name your images and pins using keywords as well. This just gives Pinterest more knowledge of what your pins are about. Hashtags are different than keywords and should be treated as such. Hashtags go into a different feed than keywords so you don’t want to mix the two up in your descriptions. I write my description with keywords inserted into sentences and questions first. Then I finish with several hashtags that are relevant to the blog post. I learned from Kate Ahl of Simple Pin Media to use a branded hashtag. That means using a hashtag with your own company name. I now add #frompenniestoplenty to the end of each of my descriptions. I’ve heard mixed messages about making up your own hashtags. Some people say not to use hashtags that don’t already exist. The big problem with that is that Pinterest doesn’t have many hashtags compared to other platforms like Instagram. Some topics like my topic of thrift shopping and reselling on platforms like Poshmark have very few hashtags. I think that leads to limited exposure, not to mention being boring. So sometimes I make up my own hashtags. I don’t want to wait for others to determine the limited set of hashtags I can use on Pinterest. I’d rather make hashtags I think others would use and put something out there by using them consistently. 1) Use my own templates. You’ll find it easier and faster to make pins when you have templates. Add your picture and type out the title in the given spots and voila, you’re set. I started out by making my own pins and when I made ones that I liked, I would switch out the picture and titles for later pins. You don’t have to recreate each pin from scratch. 2) Use others’ templates. Many bloggers who specialize in Pinterest promotion provide free and/or paid templates. Canva offers free Pinterest templates as well. 3) Get feedback on my pins. I was able to have a top blogger who is successful at Pinterest look over my profile and provide me tips on making my profile and pins better. Many bloggers who specialize in Pinterest provide (paid) consultations on profiles. 4) Analyze top-performing pins. Take a look at bloggers and entrepreneurs who are at the top of their niche. Look at their pins and try to see what makes them so appealing. Then incorporate their methods into your pin making. 5) Practice making pins. I practiced making lots and lots of pins in different styles so that I could get better and faster at the process. You could hire someone if it becomes too difficult or time consuming to make them on your own. 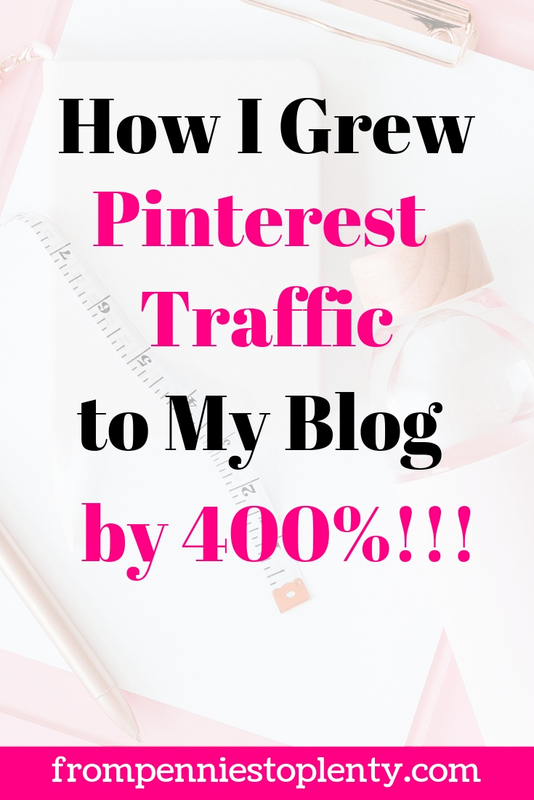 I use these resources to make better pins and improve my Pinterest performance. 1) Canva – I’m indebted to Canva. I couldn’t make pins without it. PicMonkey is another similar site where you can make pins. Each has regular and paid versions. 2) Pinterest Launch Plan by Jennifer Maker Marx. I implemented the Pinterest Launch Plan after months of frustration trying to figure out Pinterest. It’s helped me grow my blog traffic and gain several viral pins. You can read my PLP review here. 3) Tailwind – Tailwind is a Pinterest-approved pin scheduling service. It can save you from having to pin all day. It’s $9.99/month with a yearly subscription. I like their newsletters, which provide good information about Pinterest and how to use Tailwind’s features. 4) Google Analytics – Google Analytics is known as the most accurate place to get data regarding your website’s traffic. Pinterest and Tailwind analytics are generally considered less accurate or delayed in reporting. For the longest time, I did not know how to make a great pin. I read article after article about great pins but didn’t get a good sense for them because so many did not include actual examples. That’s why I wanted to put together this post of tips and examples I found that helped me improve my Pinterest game. There’s more to long-term growth and sustaining growth on Pinterest over time than I’ve shared here, but doing well on Pinterest starts with great pins. Here are two of my recent pins that have done well using the above tips. What do you think makes for a great pin? What resources have helped you make better pins?